Most people love to curl up with a hot beverage such as hot chocolate, tea or coffee as a relaxer. However, drinking steaming hot beverages has been linked to cause an increased risk of developing cancer. 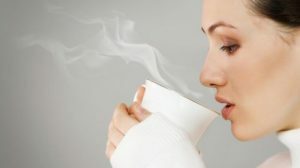 The review which included a panel of global experts, said that hot beverages above 65 degrees celsius or 149 degrees fahrenheit, could cause people to develop cancer of their esophagus. This form of cancer is the eighth most common form of cancer worldwide. This is due to the fact that hot beverages at these temperatures can cause scald burns in the esophagus. The review stated that many countries in South America, the Middle East and East Africa tend to consume teas at these temperatures. These temperatures are hotter than the hot water that comes out of a kitchen tap but not as hot as boiling water (Water boils at 100 degrees celsius or 212 212 degrees Fahrenheit). The review was part of the findings of 23 international scientists, who analyzed data on carcinogenicity caused by coffee and a range of other hot beverages, in South America and other regions. They concluded that drinking very hot beverages can be linked to cancer of the esophagus in humans.